Meet our experts. For interview requests, please contact the PR & Communications department listed above. 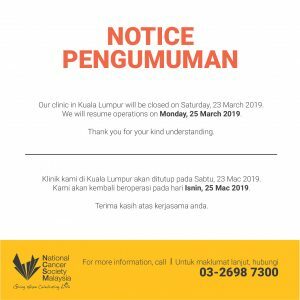 The National Cancer Society Malaysia (NCSM), also known as Persatuan Kebangsaan Kanser Malaysia, is the first not-for-profit cancer organisation in Malaysia that provides education, care and support services for people affected by cancer. Over the last 50 years, it provides holistic cancer support to patients and caregivers. NCSM supports patients in understanding and dealing with cancer in various phases through its five cancer centres – the Cancer and Health Screening Clinic, Nuclear Medicine Centre, Resource & Wellness Centre, Quit Smoking Clinic and the Children’s Home of Hope and has branches in six states, i.e. Johor, Negeri Sembilan, Melaka, Perak, Penang and Sarawak. For cancer information and support, please call 1-800-88-1000.